Whether we need them or not, we don’t usually shy away from a development board. [Keith] sent us a tip on the DragonBoard 410c after reading our recent coverage of the latest Beagleboard release. Arrow Electronics is manufacturing (and distributing, not surprisingly) the first Qualcomm Snapdragon 400 series based development board. At the time of writing there are two boot images on the 96boards.org site available for download Android 5.1 and an Ubuntu based version of Linux. The DragonBoard 410c is stuffed with an Arm Cortex-A53 (Arm block diagram after the break) with max speed of 1.2GHz and support for 32bit and 64bit code. It also has on-board GPS, 2.4GHz WiFi, Bluetooth 4.1, full size HDMI connector, a micro USB port that operates in only device mode, two full size USB 2.0 ports for host mode, a micro SD card slot. In the way of GPIO it has a 40 pin low speed connector and a 60 pin high speed connector, there is also an additional 16 pin breakout for analog audio, and the list goes on (follow links above for more info). For those of you playing buzzword drinking games not to worry, the board can be made Arduino compatible by using the mezzanine connector and there is a plan for the board to be Windows 10 compatible. Better make that a double! Halloween is just around the corner, and the spooky themed tips are just starting to roll in. If you’re looking to one-up the basic store-bought decorations, and maybe teach your kid the basics of an Arduino while you’re at it — why not build a Peek-A-Boo Ghost! Using an Arduino, two servo motors and an ultrasonic distance sensor it’s pretty easy to make this cute little ghost that covers its eyes when no one is around. They’re using cardboard for the ghost, but if you have access to a laser cutter at your hackerspace, you could make it a lot more robust using MDF or plywood. When the ultrasonic distance sensor senses someone coming towards it, it’ll trigger the arms to move — though it’d be easy to add a small speaker element too and get some spooky music going as well! The CEO of Makerbot, [Jonathan Jaglom] announced this week a massive reorganization. Twenty percent of the staff will be laid off, management will be changed, an office will be closed, and perhaps most interestingly, the production of 4th generation of Makerbots will be outsourced to contract manufacturers. This news comes just months after Makerbot announced its first 20% reduction in staff, and follows on the heels of a class action suit from investors. These are troubling times for Makerbot. In the last six months, Makerbot has closed all three of its retail locations in Manhattan, Boston, and Greenwich, CT. It has moved out of one of its office buildings in Industry City, Brooklyn as the company faces a class action suit from investors for possible securities violations. These are by any measure troubling times for anyone at Makerbot. The 3D printing industry has been forced through the rollercoaster of the hype cycle in the last few years, and where Makerbot goes, media coverage and public perception of 3D printing goes with it. According to pundits, we are now deep in the doldrums of the trough of disillusionment. No one wants to make their own parts for their washing machine, it is said, and 3D printers are finicky devices with limited utility. Despite these pundits’ projections, the 3D printing industry doubled in 2015. Multiple manufacturers of sub $5000 machines are going gangbusters, and seeing the biggest revenues in the history of their respective companies. By any measure except the one provided by Makerbot, we are still in an era of a vast proliferation of 3D printing. Makerbot, for better or worse, is a bellweather, and public perception and media attention is highly dependant on the success of Makerbot. The Verge writes – incorrectly – “…The consumer 3D-printing market’s rise has slowed”, and Business Insider writes ‘consumers are beginning to lose interest.’ These are not statements backed up by facts or statistics or even hearsay; they are merely a reflection of the consumer’s disinterest in Makerbot and not of the 3D printing industry of the whole. Unfortunately, we will not know the extent of how bad it is at Makerbot until Stratasys releases its 2015 financial report sometime in early March next year. Wohlers Report 2016, the definitive guide to the 3D printing industry, will be released sometime around May of next year. Keep one thing in mind: Makerbot did not build the 3D printing industry, and the public perception of Makerbot does not necessarily translate to the public perception of 3D printing. FRDM-K22F ARM Board doesn’t have an SD Card Socket? Not so Fast! The Freescale Freedom development boards come in several different flavors and at several different price points. It is pretty clear that Freescale counts up pennies to hit their desired target price. For example, the costlier boards with bigger processors (like the K64F which costs about $35) has sockets to fit an Arduino shield or other external connections. 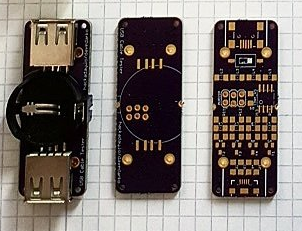 Many of the cheaper boards (like the KL25Z for $13) just has PCB holes. If you want to add sockets, that’s on you. The $30 K22F board has the sockets, but it also omits a few components that are on the PCB. [Erich Styger] noted that there was a micro SD card socket footprint on the board and wondered if he could add an SD card to the board by just soldering on the socket. The answer: yes!